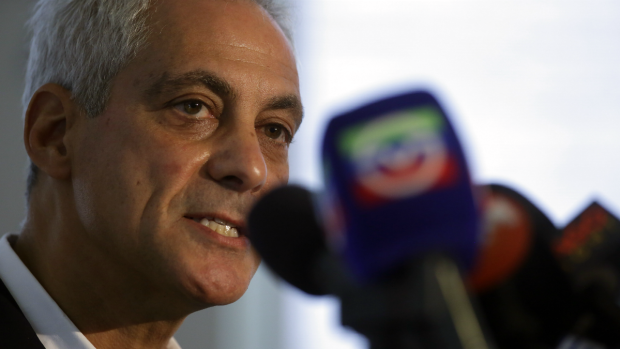 Mayor Rahm Emanuel announced Friday that the city of Chicago will file a new lawsuit against the U.S. Department of Justice over efforts to block funding to sanctuary cities. The lawsuit marks the city's second in two years against the DOJ. Emanuel said federal officials are imposing unlawful conditions on the city in order to be eligible for millions of dollars that could be used to fight crime. Last year, the application for the Edward Byrne Memorial Justice Assistance Grant (JAG) included provisions requiring local governments to allow the U.S. Department of Homeland Security access to any detention facility to meet with and inquire about the citizenship of anyone believed to be undocumented, and to give federal authorities 48 hours advance notice before releasing someone who is wanted on immigration violations, as conditions to receive funding – both changes in the program’s requirements from years past. Mayor Rahm Emanuel announced Friday that the city of Chicago will file a new lawsuit against the U.S. Department of Justice over efforts to block funding to sanctuary cities. Chris Hush reports. Emanuel said in 2017 that Chicago received $2.3 million in Byrne JAG funding in 2016 and has used the grant in the past for various public safety initiatives, including the purchase of SWAT equipment, police vehicles, radios and tasers. The city's first lawsuit argued that the Justice Department cannot make grants contingent on these requirements because they would "effectively federalize local detention facilities" and violate the Fourth Amendment of the U.S. Constitution in requiring detainees to be held beyond the timeframe in which they would otherwise be eligible for release. This time, the city is still waiting on more than $2 million from the 2017 grant, according to the mayor's office, which said it has yet to receive an award letter for this year's grant. The DOJ's shift in requirements is part of President Donald Trump’s administration’s efforts to crack down on sanctuary cities, the term used for jurisdictions that do not comply with federal requests to detain undocumented immigrants who have been arrested on charges unrelated to their immigration status and turn them over to U.S. Immigration and Customs Enforcement for possible deportation.